Eastbound on Ravenna Boulevard. Photo by the author. Seattle Department of Transportation (SDOT) staff hosted an open house on Tuesday to present conceptual plans for improving bike routes in northeast Seattle between East Green Lake Way N and 20th Avenue NE. Most of the project will simply be the installation of standard plastic posts between the existing bike lanes and vehicle lanes on Ravenna Boulevard. 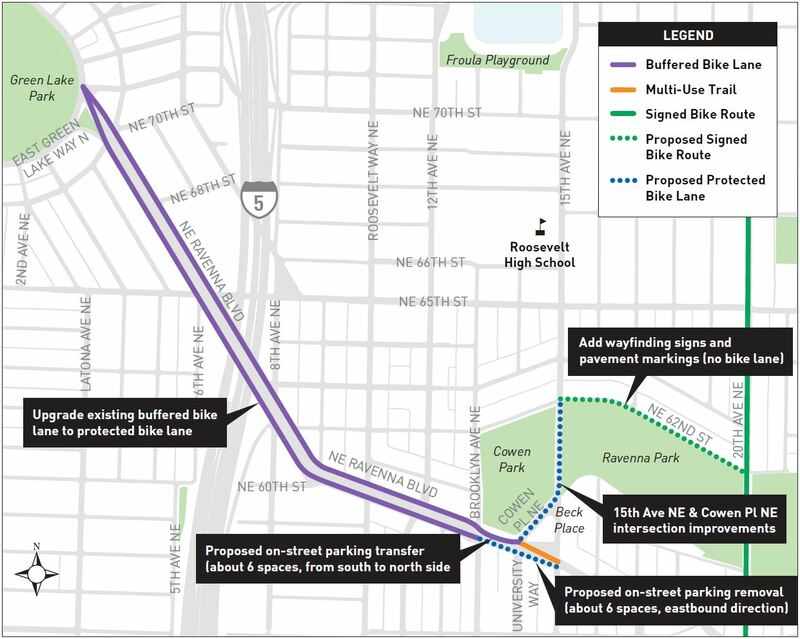 The project will also extend protected bike lanes (PBL) east to 15th Avenue NE, install new PBLs on Cowen Place and the Cowen Park Bridge, and create a two-way route for bicyclists on NE 62nd Street. SDOT mailed out notices of the meeting last month, drawing about 50 people from around the project area. I’m particularly interested because I frequently ride the entirety of Ravenna Boulevard for recreation. The meeting was surprisingly upbeat, with none of the usual antagonists, and included a diverse mix of residents. Many said they bike along the corridor with their kids. Being between two sizable parks, Ravenna is a popular route for families. SDOT staff didn’t have many visual details beyond what is available on the project website, but were able to respond to some specific questions about certain features. For instance, there will not be a painted crosswalk on 15th Avenue at 62nd Street because SDOT’s thresholds (pedestrian count, sight lines, etc.) are not met. I encountered the same resistance from traffic engineers when I requested a crosswalk further south at the 55th Street bus stop some time ago. However, 62nd Street will continue to be signed as a one-way street for cars (to cut down on through traffic) and, newly, a two-way route for bicyclists between 15th and 17th Avenues. It’s a good route for bicyclists headed east because its relatively flat and has low traffic. Further south at the intersection of Cowen Place and 15th Avenue will be one of the project’s more intriguing aspects. Currently this intersection is a no man’s land for people on foot, with unclear crossings movements and a huge southbound curb radius. With new PBLs on both Cowen and 15th, something needs to change. As with 62nd, new crosswalks can’t be installed at the current intersection. So he plan is to create an all-way stop with a new bulb-out to the east, making a T intersection. This allows smoother movement for all users and a better connection to a flat, unpaved trail above Ravenna Park. There is also a bus stop here that needs to be accomodated. The intersection might be something like the image below. I’m also excited to see an inclusion of what I suggested to SDOT several months ago: extending the eastbound bike lane two blocks between Brooklyn Avenue and 15th Avenue. Currently the lane ends at Brooklyn Avenue as the street begins climbing a hill, making for a dangerous mixing zone. Extending the PBL will get people biking safely to the top of the hill. In addition, the Brooklyn intersection will be made an all-way stop. Some parking will be lost between University Way and 15th, and parking between University Way and Brooklyn will be relocated to the other side of the street, which currently has as 21 feet wide drive lane. The idea I sent to SDOT is below. My simple suggestion for a bicycle hill climb. With a $200,000 budget the project can’t include all of the bells and whistles. 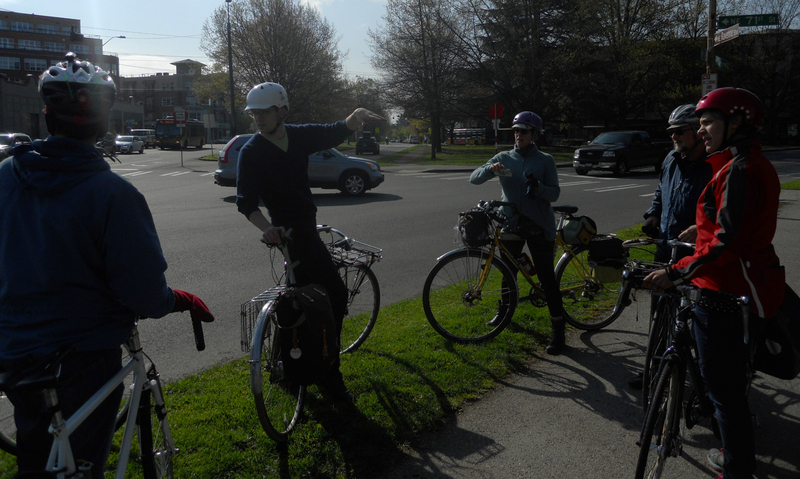 The preferred features were discussed on Sunday by a group of local residents and Seattle Neighborhood Greenways members who rode along the project route. Organized by Brock Howell, policy and government affairs manager for Cascade Bicycle Club, we primarily discussed the issues at intersections. At three signalized intersections the bike lane and a left-turn lane for cars swap places, resulting in the setup pictured at the top of this post. It would be ideal to have the PBL stay on the left, but to help prevent bike-car collisions would require expensive new traffic signals. 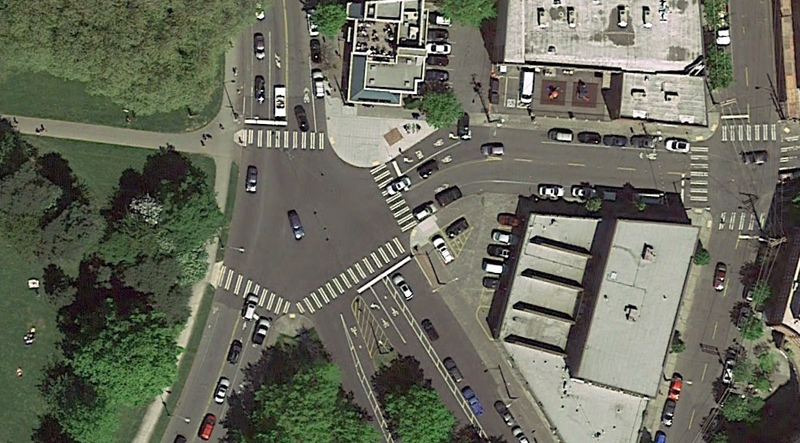 At the very least, SDOT will be able to paint pathways across intersections to make movements more clear. There will also be a painted bike box for right turns onto the new Roosevelt PBL when that repaving project is done later this year. 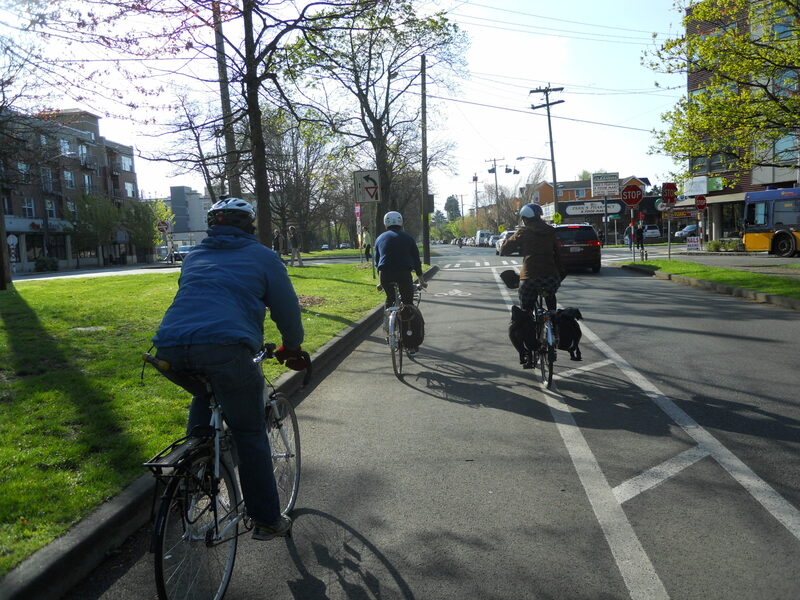 The north end of the new 12th Avenue NE greenway doesn’t have a left-turn option for people on bikes. 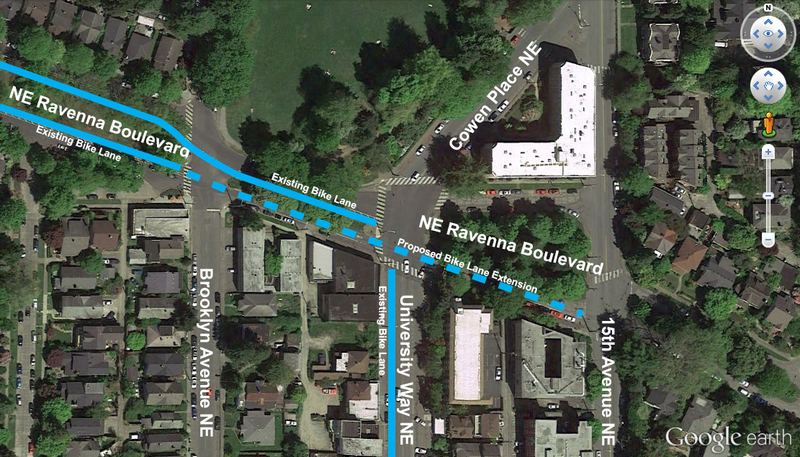 The Ravenna median blocks through movement. Unless they’re adventurous, bicyclists need to turn right, go down to Brooklyn, and turn around. Preferably there would be a path through the median, like there are for cars in other places. However, the median is actually a park controlled by the Parks Department and part of the city’s prestigious Olmstead Boulevards system. The department is reluctant to change anything, even though the median is already heavily used by people walking, jogging, and playing spots. One person brought up the issue of traffic congestion in front of the John Marshall K-8 school on Ravenna at 68th Street. Twice a day school buses tend to double park and traffic is often forced into the bike lane. Options include placing the PBL bollards closer together in this area and designating bus loading zones on 68th Street. Yet another problem is at the west end of the project area, the intersection with Green Lake Way and Ravenna Boulevard. It’s a weird shape and uncontrolled, but because drivers move slowly there haven’t been any serious injuries here in recent history. Still, it would be ideal to make the intersection smaller and remove turn lanes to make everyone’s movements more predictable. A paint-and-bollard bulbout at the west side is possible for this project, but SDOT did some reconstruction here recently and isn’t interested in a more solid fix. All told the project will be a positive improvement for all travelers in this area. People biking will get more protection from moving vehicles, people walking will find it easier to cross at controlled intersections, and people driving will benefit from greater predictability. The project will be implemented through this summer. Check out the meeting presentation (PDF) and the project website for more details and to submit comments or questions. A group of residents discuss improving a complex intersection in Green Lake. Photo by the author. This entry was posted in Biking, Cars, Schools, Transportation, Walking and tagged 15th Avenue, 62nd Street, Boulevard, budget, Cascade Bicycle Club, Cowen Park, Cowen Place, department of transportation, features, Green Lake, improvements, intersections, Olmstead, Parks Department, PBL, project, protected bike lanes, Ravenna, Ravenna Park, redesign, safety, SDOT, Seattle, timeline, University Greenways. Bookmark the permalink.